Thread: Tell me what is..
Ladies are buying cash register (adding machine) tape, comes in a roll, couldn't tell you how many feet are on each roll, but it is a lot. Some are just sewing strips on it using it as a foundation, others are sewing scraps together using it as a foundation. It seems the tape keeps things straight and these can be sewn together. Some have show them here on the board, maybe you can search for them. Try either cash register or adding machine. As I continued looking through recent topics I found this: http://www.quiltingboard.com/picture...r-t226393.html I think you will be able to see for yourself. Last edited by MartiMorga; 07-23-2013 at 12:41 PM. These are both beautiful! I love the leaves quilted on the top one! From what I've seen many don't take the paper off the back but leave it in until it is washed and it dissolves - not isure I like that concept - don't know what, if anything, all that would do to my septic system! maybe I'm not getting the gist of this - is the tape just to keep your lines straight? 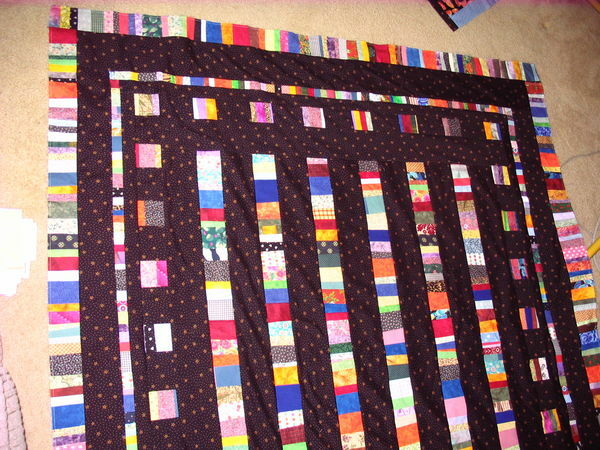 Do you rotary cut along the edge of the tape after sewing your scraps into a strip? I'm trying really hard to organize this process in my head....help? 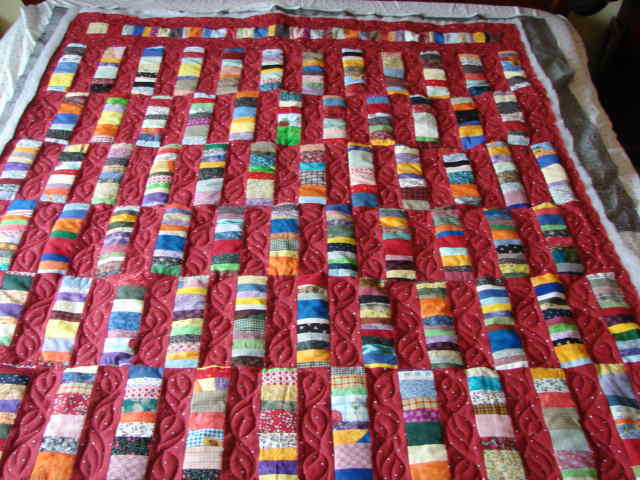 Check out quiltville.com. Bonnie Hunter has been working on her scraps adding them to paper strips. watch her quiltcam. She explains what she is doing really well. I do my piecing on paper because I do not like to starch my fabrics, especially if I'm using a huge variety of fabrics in a quilt top. I save used printer paper to use as a stabilizer when I sew on straight of grain. Because it tears so easily, I use cash register tape to stabilize when I sew on the bias. I remove the paper as I go. Last edited by weezie; 07-25-2013 at 05:03 AM. Years ago, you did your fancy decorative machine stitches with adding machine tape as a stabilizer. It could be a bear to remove, but you didn't have puckers. If you don't like paper, there is embroidery stabilizer that washes away. You can draw on it. I've used a single layer for stand alone lace which is high stitch count. The stuff comes on a roll, and you can cut what you need into strips or whatever. I would absolutely NOT use the wash with the paper on idea if you have a septic system. If you don't want to hassle with removing paper, you can also cut strips of muslin to use for the foundation. If you use the muslin, you are not limited to the 2-1/2" width of the paper, but make them as wide as you want. THANK YOU Caroline for asking this question....I have been wanting to do a Bargello quilt for a very long time and as soon as I read ''Cash register tape' I seen it in my minds eye how easy it will be to keep those little squares straight. Wow, what a great idea. I have a case of those from when my husband had a business and didn't think I would ever get them used. Gives me one more project to try. Thank You. I believe the lady that said she didn't remove the tape finished her quilt first - quilted and bound - then washed it and the tape just dissolved INSIDE THE QUILT. Didn't go in the septic tank. Last edited by CoventryUK; 07-25-2013 at 08:47 AM. Somewhere in the tutorial section is a tutorial on making these. o a search and see if you can find it. It has been several years. Beautiful job on both!!! I love them. Thanks for the info!!! I can think of several applications I might use them for. I have been using various sized strips of muslin (very thin muslin) to sew my scraps to. I make sure that no fabric is repeated on the same strip. My plan is to put them all together for a charity quilt. The samples I saw here are much prettier than my original idea - Thank You. Anyhow, the strips with the fabric backing allow for very thin or no batting (like for a summer quilt) AND the extra bonus: It uses scraps! I think I would soak it in the tub and then pick out all the pieces of paper before draining it, maybe?